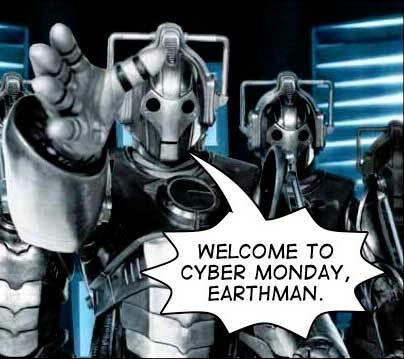 Cyber Monday? Think "Cyber December"
Cyber Monday brings Web surfers out in droves. They are looking for good deals on items on their lists, and products they don't even know they want yet. As such, it's important to be prepared, to strategize and make sure you get the biggest bang out of your marketing budget - not just for Monday, but also the coming weeks. The National Retail Federation expects nearly 60% of workers to shop over their lunch hour on Monday. As a retailer, that means you should set your PPC bids at the highest your budget allows during these hours, then scale them back in the afternoon. Of course, if you're a local retailer, take time zones into consideration. Naturally, traffic spikes for most online retailers on Cyber Monday. Look at the chart below from Compete.com and you'll see this holds true for some of the Web's most heavily trafficked retailers. That means you need to make sure your site is ready for the influx. 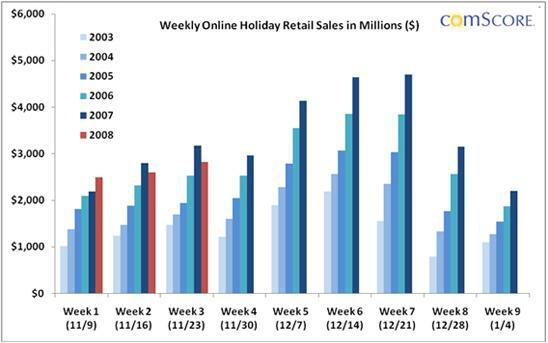 However, Cyber Monday is not the biggest online purchasing day of the year. That day occurs somewhere in the middle of December. Data from comScore illustrates this point, as does a study from the International Council of Shopping Centers and Goldman Sachs. Their annual study shows that only 11% of consumers say they have 50% or more of their gift buying done already. That is down from 15% last year, and 25% from 2004. In essence, consumers are procrastinating and that means they will be shopping feverishly as December draws to an end. For retailers, this means that your budget should follow these trends - you want to garner the initial traffic surge, but also make sure you have enough left in your budget for when it really counts. Increase bids on Cyber Monday, scale back that week and start increasing them again towards mid-December. And get creative. Consider promotions or email blasts touting "last-minute" gift ideas, savings and shipping options and discounts.